No one seems to know why it is i am getting a running nose for the last 3 days days of 100% compliance with paleo. (previous question) I had been doing 85% compliance for 5 weeks but had a short fall by drinking a bit of alcohol over a 2 week period at xmas. (1-2 glasses of wine almost daily, this is alot for me) and also eating chocolates and deserts. So i decide to go 100% and i find that for the past 3 days i am thoroughly exhausted by the end of the day, i am also cranky and have a low grade headache and tinitis (plus the nasal drip) despite the xmas binge i was still eating 70% paleo during that 2 weeks, plus i got sick with a nasty flu 2 weeks into the 85% compliance. when i first started... sigh... It seems going 100% has made me feel worse, but i am hoping things will get better? will it? I notice that ladies have a harder time than gents in increasing fat intake, probably because of the lipophobia. Up your fats or your going to experience the "faileo diet". If you increase carbs don't expect to lose much weight, you might still feel better nevertheless, but fat is the ideal energy source (I will omit the lengthy scientific explanation). Monounsaturated fats are best. Why? She's making herself miserable by restricting carbohydrates, likely to ketogenic levels. She should eat some carbs and feel awesome again. Eat more meat and fats, especially coconut oil. meats, fats like avocado and coconut oil, salads and veggies, nuts and seeds. Before I try to respond I just want to understand what you consider "100% paleo". ... I get a little thrown off by people putting percentages on it since every person's paleo is different. You could be 100% paleo by eating nothing but apricots and coconut oil for all I know. 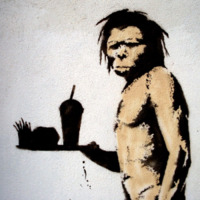 What exactly do you consider "100% paleo"? thank you , im afraid i live in australia so i was unaware of the time being 2am in america (oops:) it seems it has cleared up now and all this was followed up by a headache for 3 days and then yesterday i started crying in the local paleo restaurant because i was losing it due to carb withdrawals. The owner of the shop was very nice and helped me to understand what was happening to me on a pysical and emotional level. Its been 8 days straight now and i do feel a lot better today although still quite tired. Putting this together with your other post. It sounds like you have an upper respiratory tract infection or a respiratory syncytial virus. Go see a doctor. If it's a virus, you will feel better in 4-8 days. If it's a bacteria, get an anti-biotic (regardless of what people will say here). Also, asking a question at 2am EST on Jan 2nd and expecting to get a response within 5 hours is a bit far-reaching. Give people some time to respond. Also, if you put these two questions together you would have gotten a better response.